on efficiency and room turnover times. 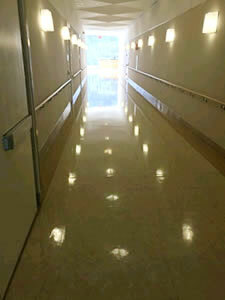 Medama floor care is a complete installation, maintenance and repair floor care system. 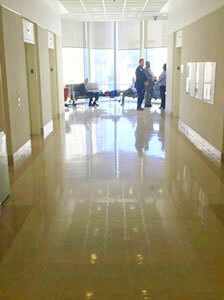 All of our floor systems involve the latest advances in floor coatings. 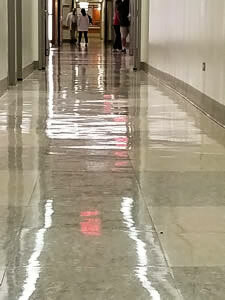 Our fast drying, low odor, alcohol resistant, high reflection/shine coating systems are designed for all types of flooring. Our super aggressive, environmentally friendly, low odor strippers can remove polyurethane, mastic glue and even paints from all types of surfaces.We can even permanently eliminate the need to strip or wax ever again. Let one of our consultants visit to customize a floor program that will fit your needs. The only safe, environmentally friendly, concentrated cleaning solution on the market that is an EPA approved sanitizer, virucide and fungicide that replaces ninety-five percent of your cleaning chemicals. EPA-approved hydrogen-peroxide based disinfectant effective against Clostridium difficile (C. diff) spores. This system is not only safe and environmentally friendly for all kinds of cleaning and disinfecting (including cdiff spores) ,but can also be used for special projects such as eliminating bed bugs, cleaning tight areas such as elevator tracks, restoring bathroom grout and cleaning of rolling stock. Approved to kill Clostridium difficile (C. diff). Unique dispensing system that prevents sabotage and misuse. A turnkey measurement with a software program that measures how well your surfaces are being cleaned and disinfected. The most advanced ultra-microfiber system on the market. Adopted by one of the top health care systems in the country, you will reduce your carbon footprint while significantly cutting your use of chemicals. Your corners and edges will never look the same after incorporating this unique system into your environmental floor care program. A high-quality product line with attractive free dispensers (hands-free also available). A far more superior product than most brand name products on the market that will improve hand hygiene and infection rates without breaking the bank. Are your machines coming back broken and dirty? Ace Janitorial’s repair department will fix your equipment in a timely manner. We are licensed to repair all major manufacturers as well as lesser-known brands. Your equipment will be returned clean and ready to perform. We guarantee you'll be satisfied with our work! Allow our technical specialists to install, refill and maintain your deodorizing systems. We have proprietary systems to tackle the worst odor conditions in the industry.